Storm is a specialist combat role for Sangheili serving in the Covenant and its remnants, acting as shock-troopers for the original Empire. Storm are usually the military backbone of the Covenant remnant factions. Storm are specialized shock-troopers that can serve in assault roles, marksmen roles, and scouts. Sangheili Storm often lead lower-ranking Unggoy and Kig-Yar on the battlefield while reporting to higher-ranking Sangheili Commanders or Zealots. Following the Great Schism many Storm-class Sangheili joined the Swords of Sanghelios, while others joined Jul 'Mdama's Covenant or became mercenaries. While Storm troops served as specialized shock units under the original Covenant, post-war Storm troops would serve a more generalised infantry role similar to Sangheili Minors. Like Rangers and Zealots, Storm-class Sangheili have their own internal ranking structure. Sangheili Storm clad in blue harnesses are the equivalent of Minors. Storm units in red harnesses are analogous to Majors. Ultras may be equipped with white-and-red harnesses. Sangheili Storm with command status wear golden harnesses, making them similar to Field Masters. Green-armored Sangheili Storm may be Sangheili who temporarily allied with Arbiter Thel 'Vadam when the Great Schism started but left him afterwards due to ideological differences. The Sangheili Storm often wear the Storm harness, Lodam Armory's first fully in-house armor system. The harness is simple, sleek, and efficient. The helmet covers the full span of the face, while the harness proper has form-fitting greaves. Unlike the more thoroughly protective combat harness, the Storm armor tends to leave its wearer's arms exposed; however, the Storm harness used by the Swords of Sanghelios features an all-encompassing body glove similar to the combat harness. The Storm harness is most often issued in blue, though green, red, white, and gold versions also exist. The Sangheili Storm affiliated with the Swords of Sanghelios have crimson harnesses with ivory accents. Sangheili Storm within Jul 'Mdama's Covenant were often armed with Type-55 storm rifles and Type-51 carbines, while using Type-33 Needlers or Type-25 plasma pistols as sidearms. Occasionally they wielded explosive weaponry like the Type-33 fuel rod gun or Type-50 concussion rifle. They were occasionally seen using Type-1 energy swords. Sangheili Storm on Requiem sometimes used Forerunner Z-110 boltshots. By October 2558, Many Sangheili Storm began to make use of Type-54D plasma pistols, Type-56D Needlers, and Type-57B carbines, as well as Type-58 fuel rod cannons and Type-53 Plasma Casters. In War Games simulations aboard the UNSC Infinity Sangheili Storm are sometimes equipped with Type-27 beam rifles and Z-180 Scattershots. 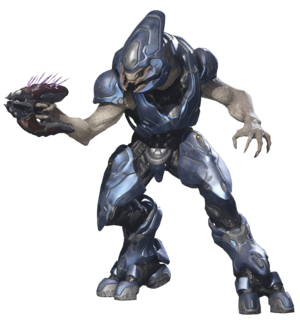 Sangheili Storm typically carry only storm rifles and Covenant carbines and very rarely wield energy swords throughout the campaigns. Their shields are weaker and they are more likely to make mistakes in combat than the higher ranking Sangheili, especially on lower difficulties. Concept art of a Sangheili Storm. An early render of a Sangheili Storm in Halo 4. A render of a Sangheili Storm. Two variations of the Sangheili Storm. Sangheili Storm during the Human-Covenant War. A Sangheili Storm impales a human civilian on his Energy sword. John-117 battles a Sangheili Storm wielding a storm rifle aboard the UNSC Forward Unto Dawn. A Sangheili Storm attempts to engage the Master Chief wielding an energy sword. A Sangheili Storm aboard Ivanoff Station. A green-armored Sangheili Storm in Halo 4. A Sangheili Storm using a Type-33 needler. A Sangheili Storm firing his storm rifle. A red-armored Sangheili Storm in Halo 4. A Sangheili Storm pointing with his storm rifle. A Sangheili Storm in Halo 4's Spartan Ops episodic campaign mode. Sangheili Storm in Halo: Infinity. A Sangheili Storm commanding Unggoy and Kig-Yar soldiers. A Sangheili Storm part of Vata 'Gajat's mercenary group during the Battle of Ealen IV in Halo: Escalation. A Sangheili Storm dual wielding an energy sword and plasma pistol aboard the Unrelenting during the Battle of Chi Ceti in Halo: The Fall of Reach - The Animated Series. Render of the Sangheili Storm in Halo 5: Guardians. A profile image of a Sangheili Storm in Halo 5: Guardians. Sangheili Storm part of the Swords of Sanghelios fixing a Sword Type-54 Banshee in Halo 5: Guardians. A Sangheili Storm sitting with Dimkee Hotay during the Battle of Nuusra. Two Sangheili Storm attack a Spartan-IV on Raid on Apex 7. A Sangheili Storm on Escape from ARC. A cloaked Sangheili Storm on Attack on Sanctum. Sangheili Storm with Z-180 Scattershots and Type-57B carbines on Urban. A Sangheili Storm with a Type-27 beam rifle. Dead Sangheili Storm in Forge. The Storm harness in Killer Instinct. Spartan Jameson Locke and Arbiter Thel 'Vadam battle Sangheili Storm during the Battle of Sunaion in Halo Mythos. John-117 killing a Sangheili Storm in Halo: Tales from Slipspace. Kelly-087 killing a Sangheili Storm in On the Brink.